BACKTOFRANKBLACK.COM: "Not Bad for a Human": Order Your Copy Now! Well, folks. the long wait is over, your appetites can finally be sated... Back to Frank Black is very pleased to be able to pass on the (quite literally) hot off the press news that you can order your copy of "Not Bad for a Human" now! The official website now has a link from which you can order a copy of the Limited Edition hardcover of Lance's official biography, co-written with Joe Maddrey. And, better still, order through the website and you will receive a copy SIGNED by Lance Henriksen. Back to Frank Black will be posting our own review of the book in the very near future, but it goes without saying that this is a must-have purchase for all fans of Lance and Millennium, with significant coverage given over to his time on the series. Here's your opportunity to own a very special version of this tome, so go there now! 2 Responses to ""Not Bad for a Human": Order Your Copy Now!" I know this seems a little random, but I tried to post in keeping thematically with your book post. You seemed like the right person to get some feedback from on a few books I was considering. Do you have any thoughts positive or negative concerning Robert Shearman's Wanting To Believe book. It looks reasonably good from the sample on Amazon. He appears to have been a writer on Doctor Who, but didn't know if you had the chance to read that book. I also wanted to know if you would recommend Jane Goldman's Book Of The Unexplained or Dean Kowalski's The Philosophy Of The X-Files. I did receive my copy of the Lance book. I look forward to reading it. The X-Files CD set from La La Land should be along any day. I can't wait. I think I'm going to purchase The X-Files CD The Truth And The Light. It looks like an interesting mix of score and dialogue bits. Take care and hope this finds you well. Robert Shearman did indeed write for Doctor Who - a great episode from Series One of the relaunched series called "Dalek". As for his book, I don't own it myself and from what I understand it is little more than a set of episode-by-episode personal reflections on every episode produced by Ten Thirteen. If that's your thing, then I'm sure it's quite insightful in its way, but for me it's a little subjective. I actually own both volumes of Jane Goldman's "Book of the Unexplained" and so can speak directly to that one. It's a nice, glossy title that contains a mix of references from the series and backgrounds on some of the unexplained phenomena it explores. Again, if that's your thing - and with an interest in all things Fortean it certainly is mine! - then it's worth checking out. "The Philosophy of the X-Files" I don't know at all, I'm afraid, although you've piqued my own curiosity now! I can recommend one other title I have on the shelf here, though, which is "Deny All Knowledge: Reading The X-Files" as edited by David Lavery, Angela Hague and Marla Cartwright. It takes quite an academic approach to The X-Files' early years and is very good indeed. You should be able to find that one via Amazon or most reputable online marketplaces. I hope that's all helpful to a point, then. 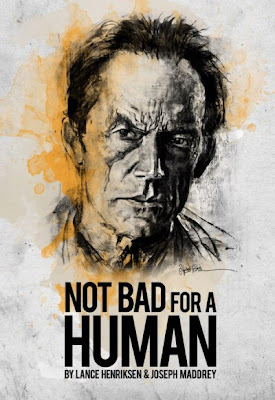 I've also received my copy of "Not Bad for a Human" and, whilst I've yet to have had a lot of downtime to delve too far into it, from what I have consumed so far it's a great read and as unique a biography as we should have expected from Lance. And I also have my other eye on the mailbox for the new Mark Snow X-Files set to arrive! "The Truth and the Light" was quite a specific title given the mix of music and dialogue, but I would still say it's a must-have... for Chris Carter's opening monologue alone. That reminds me of some spooky drives home through dark forests when it first came out!